UKPC is the subject of a winding up petition from HMRC. Given the large dividends trousered by the owner Rupert Williams recently, it would appear he could save the company if desired. However, it may be the intention to phoenix the company to get rid of the debt to HMRC. Only time will tell. Mx X's vehicle was picking up a disabled passenger from a cruise ship at Southampton. Mx X was not the driver. The port has byelaws which mean that the Protection of Freedoms Act 2012 keeper liability provisions are not in force, and only the driver is liable. ParkingEye also failed to make reasonable adjustments to the disabled passenger; for instance, to let them take longer than able bodied passengers. Turned up at court with my relative. Parking Eye had sent along someone from LPC who was pleasant enough but we obviously engaged in minimal small talk prior to going in to see the judge. When we got in front of the judge my relative asked if I could speak on their behalf. The judge basically said no, but he might let me speak later, the LPC person then pointed out that the law on Small Claims does allow for lay representation. The judge looked less than impressed. I wanted to try and speak and raise the issue of the "Rights of Audience" at the start but again I was asked not to speak at this stage. The judge pretty much went straight for POFA and the Byelaws and spent some considerable time questioning the PE rep as to why they felt the Car Park was relevant land. Although they made an attempt to do so I go the impression early on the judge was not having any of it. They then spoke to my relative who confirmed that the witness statement was true, they did not drive the car in or out of the car park and were in fact met from the ship. The judge accepted that this was the truth. They did however ask who was driving and despite the best efforts this was revealed to the court to be the person who provided the witness statement stating that a port employee had said they had to wait in the car park area. The judge went back to the issue of relevant land and I felt was somewhat scathing of the fact that PE had used an opinion from the BPA as the basis of the argument regarding this. The LPC person tried again but I got the impression the judge was getting rather irritated at this point. I was then asked if I wanted to speak. I attempted to bring up the issue of "Rights of Audience" and was shot down almost immediately with "I am not going there". I also brought up the size of the witness statement in relation to the claim (little response - perhaps a slight nod). I asked for the witness statement to be disregarded as the person who had written it was not present. I was told that as they had informed me in advance that they would be sending a representative then that was not relevant and the statement would stand. Finally I stressed that we felt that the land was not relevant land and therefore PE did not have the ability to take action against the registered keeper using POFA. The judge then went into a fairly lengthy summing up going through the byelaws and pointing out the fact that ABP (in accordance with the byelaws and statutes) did have the ability to change the byelaws. They also, under the existing byelaws had the ability to enforce penalties for any breach of the byelaws and because of this the land was not relevant as defined by POFA and so the ruling was for the defence. There have been a rash of judges getting the rights of audience issue wrong lately. The Lay Representative Order 1999, gives anyone rights of audience in the small claims track, as long as the person they are representing is there. The Prankster suggests lay representatives print out and take a copy with them. BW Legal are still filing claims for parking events at Albert Street, Birmingham, on behalf of Vehicle Control Services. This is despite the fact that Vehicle Control Services do not appear on the signage, and therefore there can be no possible claim that a contract existed between themselves and the motorist. By their actions they therefore appear to be well aware there is no valid claim. This does not stop them filing new claims anyway, presumably in the hope that the defendant does not bring this point up and pays before a hearing. If the claim goes to a hearing, presumably they hope the judge is having an off day and does not notice the signage is not in their name. The Prankster questions the ethics and morals of Sean Barton, CEO of BW Legal, in allowing his company to file claims when they know there is no standing to bring the claim. The Prankster has asked Mr Barton if he wishes to comment on his reprehensible actions. Vehicle Control Services are a member of the International Parking Community (IPC), The IPC have stated they will take no action on this matter. 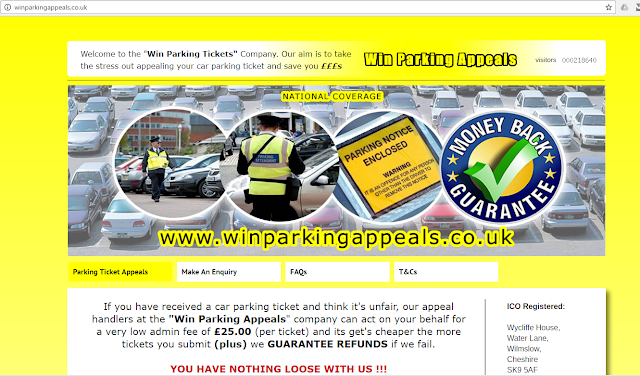 The site owners don`t appear to have any appeals handlers and appear to have won zero appeals. They appear to have copied (badly) the site from the old Appeal My Ticket site. The site claims to have ICO registration CSN1934969, but this does not check out on the ICO website. The site claims 218640 visitors, and to peak at 1178 hits per month as on 1/3/17 and to have 500 submissions in "the last months alone" but was registered on 17 March 2017 according to whois. The site appears to be similar to one previously owned or controlled by Mark Seddon and Peter Lunt, so The Prankster would appreciate any information from those two gentlemen as to whether they are the owners of this new site, and if so what exactly is going on. Remember, "You have nothing loose with use"
The Prankster wishes to make it clear Tony Tyler has nothing to do with this site. This processes charges for the bargain price of £15, compared to £25. as long as the ticket is issued in Liverpool. Despite the fact the domain was only registered on 16 March 2017, they claim Our Parking Appeal success is very high and we have had over 500 successful appeals in the last 18 months alone from our website. The 'visitors to domain' counter appears to be shared with the other site. If you visit one site then the other, the shared counter increments by one. The Prankster has put a number of questions to the twitter account of the site, @andsavemoney.